I just submitted my latest column to Courrier Japon, which was about volunteering at San Quentin. Last time I was there, the staff had given me some photos I could use with it, so I thought I'd share them on my site too. 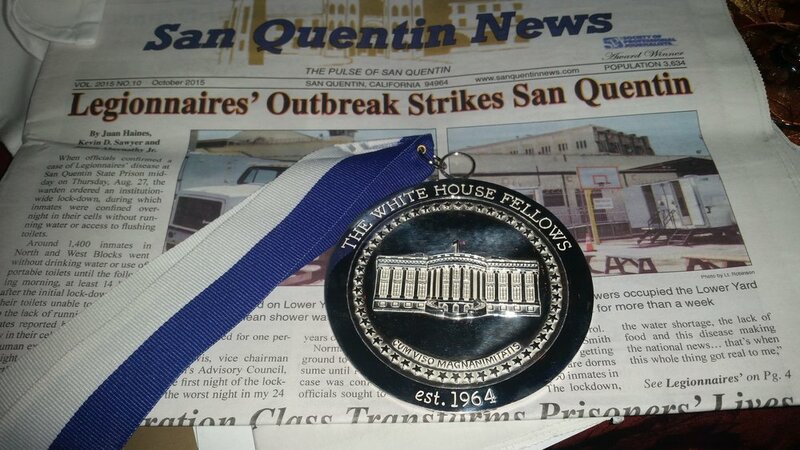 Photo credit to San Quentin News. The San Quentin Yard - I've never seen it this empty, but this is where I walk across to get to the Education Center, the white rectangular building in the back. The San Quentin News newsroom is in the left corner of the building with the red roof. My first time inside, I did not expect to see a tennis court. More surprising though were the geese and ducks that usually hang out in the baseball field. People react to my involvement at San Quentin in so many different ways. I recently told somebody about my work at San Quentin News, and I got a most condescending response. "They have a newspaper?" she asked. "How cute." As you can see here, the newspaper is quite serious. The staff are all members of The Society for Professional Journalists. This is a shot of the newsroom. The people sitting at the table are a mix of volunteers, advisors and staff. The black guy is Bonaru, the editor-in-chief, and the guy to the left is Jesse, who is a staff member and one of my students. You can't see his face, but the guy in the back, who has his back turned to the camera is Chiu. One of the things I love about this place is the diversity. The staff as of last March. The black guy with the glasses in the middle is Wali, my counterpart in The Journalism Guild, which is the official name for the group that I teach. I would be lost without Wali. He not only makes sure that everything is set up for me, he also manages the guild members, who consist of men who want to take my classes and contribute to the paper. It's a feat to manage people from various backgrounds and abilities, but he has an ability to be firm yet inclusive.